Warning: the following story contains graphic language describing matters some readers may find disturbing, a situation not ameliorated by the editor’s propensity for using the most lurid terms available. First of two parts. – Ed. HUMBOLDT – Frank Festag is about the most normal person you’ll ever meet. With an easy laugh and gently philosophical air about him, Festag’s idea of a grand time is playing with his grandchildren in his greenhouse, where he raises different varieties of tomatoes. A working man needs that kind of wholesome relaxation after scraping human brains off of walls all day. If he’s lucky, that is – some jobs require the wall itself be pulled out and hauled away. Festag cleans up crime scenes. After police have come, arrested suspects, tagged and bagged evidence and left, it’s up to Festag to detoxify the domicile. Doing so requires an arcane skill set, sometimes a strong stomach and, like emergency first responders and others, a certain ability to mentally compartmentalize experiences. Originally from Oakland, Festag gained expertise in managing difficult situations. For a time he installed vaults and safes, even ATMs. He also became skilled at the reverse procedure – breaking in to bank vaults when the timers that control them fail. Another variation involved removal of old, disused vaults. These generated more stories to tell, including finds of everything from drugs to diamonds squirreled away in and around the old safeboxes. In order to do that job, he said, you have to know all the building trades – all of them – and have to be pretty good at them. That led Festag into work as a remodeling contractor. Among his more difficult jobs were restoring homes which had been damaged by various forms of contamination, including shootings – some self-inflicted – and drug manufacturing. Then Festag saw a few fateful films. Festag decided to train up and do it right. He obtained certifications from the California Occupational Safety and Health Administration and Department of Transportation in handling of hazardous materials and blood-borne pathogens. With all his official ducks in a row, Festag founded CSI Decon, his decontamination business. That prepared him for a range of situations, from messy death scenes to poison-polluted drugmaking facilities, their particular perils as varied as the skills required to reverse them. 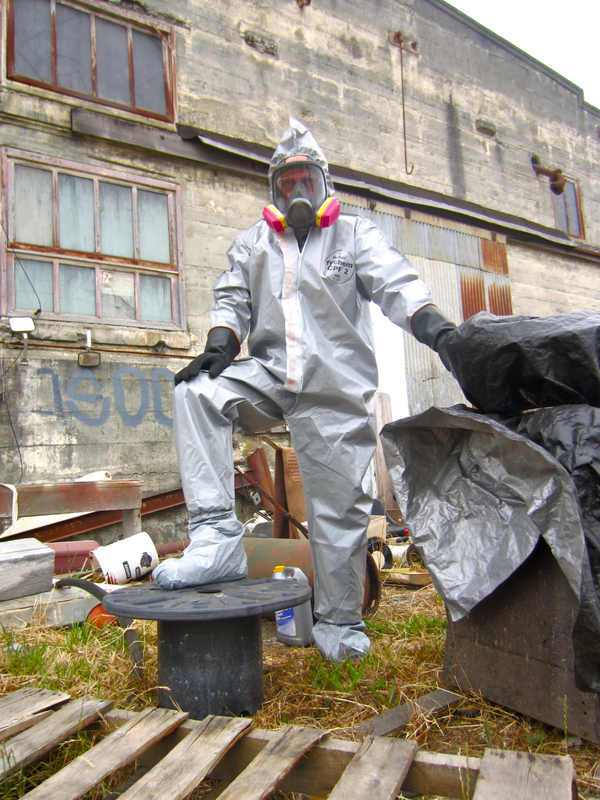 “My main service is to first decontaminate things, clean it, remove it and make it safe for the other people to come in,” he says. That’s easier said than done, and not for the squeamish. Festag never knows quite what the authorities will leave him to deal with. He’ll start with an assessment of the extent and depth of contamination. An understanding of housing construction is key. Even in death, people are individuals, decomposing at different rates. Festag then goes in, opens the windows to air the place out and gets down to cleaning. Not long after that, tragedy became more personal. “Before I was 13, I watched my father die, my mother die, and my best friend died in my arms,” he says. Like others must manage tragedy, Festag powers through it by focusing on the practical exigencies of the moment. He’s hired to git ’er done by others who will handle the mourning chores. He doesn’t dwell on the implications of what he is remediating, as that would just slow him down. Festag’s cleaning technique is simple: broad strokes followed by details. Besides, it’s not like there are going to be any surprises. “I think I’ve seen pretty much everything now,” he says. By day’s end, all the carnage-scrubbing helps a man work up a mighty big appetite. End of part 1. Next week: cleanup of meth labs and grow houses. This entry was posted on Tuesday, August 30th, 2011 at 10:11 am	and is filed under News, Community, Environment. You can follow any responses to this entry through the RSS 2.0 feed.